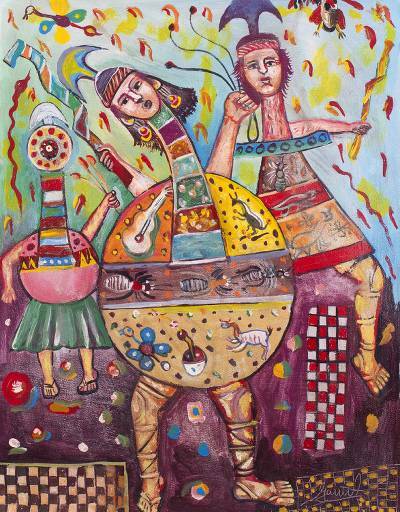 Three ancient Mochica hunters perform a traditional dance before a battle, captured with a vibrant array of colors in this painting by Peruvian artist Gavino Aguirre. Weapons in hand, the hunters raise their arms toward the sky as confetti leaps through the air. Two of the hunters are painted with the images of local Peruvian animals, as well as the image of a guitar. The artist paints in the cubist style, distorting and deconstructing the subjects' features.